Partial dentures are an appropriate solution when the other teeth in your mouth are healthy. It is always preferable to keep your natural teeth, however, if this is not an option, a full denture may be the right solution for you. DDS Dentures + Implant Solutions also offers the All-In-One dental implant solution – a more permanent, implant-based solution that “fixes” your dentures in place. Learn more about the All-In-One Solution. Your unique dental needs will dictate the overall cost of your partial denture. However, partial dentures are certainly a cost-effective solution for most patients, especially with our low prices. Additionally, DDS Dentures + Implant Solutions offers a Price Beat Guarantee. If you have a written treatment plan and cost from a competitor and choose to receive comparable services from DDS Dentures + Implant Solutions, we will beat the competitor’s price by 10 percent. Chances are, our rates already beat those of our competitors! Can I eat with partial dentures? 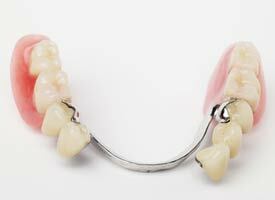 Partial dentures are designed to give you all the form and function of natural teeth. It may take some time for you to adjust to your new partial denture, but eventually, you will be able to enjoy most of the foods that you love. You’ll want to begin with soft foods and should take care to chew slowly and on both sides of the mouth. Particularly hard or sticky foods should be avoided. Can I sleep with partial dentures in my mouth? The safe, healthy choice is to not sleep with your partial denture in place. Sleeping with partial dentures is not recommended for a number of reasons. Partial dentures are designed to be cleaned outside the mouth – which also provides the opportunity to ensure no food particles are lodged under or around the partial. Proper oral care and keeping you partial denture clean is vital for the overall health of your gums. From a physical standpoint, your gums will benefit from the opportunity to rest and recover. Also, some patients may clench their teeth in their sleep. This pressure can cause damage to both natural teeth as well as dentures. DDS Dentures + Implant Solutions is focused on giving you exceptional service and quality while providing you with the right solution for your unique dental needs and your personal budget. If you feel partial dentures may be right for you, call (844) 693-3688 or find a DDS Dentures + Implant Solutions location near you.